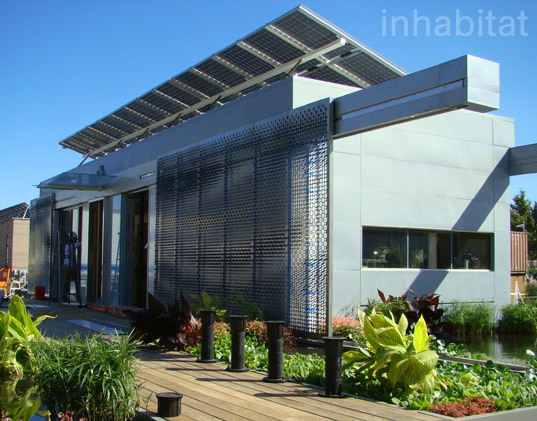 The 2009 Solar Decathlon may have come to a close, but we wanted to shine a little more light on one of our favorite projects, Virginia Tech’s LUMENHAUS. Ranked 4th in this year’s Architecture category, the LUMENHAUS is named for its “power of light” attributes and architectural references to the BauHaus movement, and was particularly inspired by Mies Van Der Rohe’s Farnsworth House. Like its historic reference, it is comprised of all glass walls, maximizing exposure to natural daylight. The house features an automated “Eclipse System” of highly insulated translucent panels that filters the light using independent sliding layers, creating an ever-changing pattern throughout the day. As described in Virginia Tech’s especially high-tech animated presentation, the LUMENHAUS manifests a “whole building design” construction approach comprised of five categories representing the team’s top priorities for someone living in the home. The first category for SMART living demonstrates optimized home systems that automatically adjust to weather and can be monitored in real time by a weather station on the house itself. The house power consumption can be closely monitored on the central entertainment screen, showing how much energy is produced, where and how much is consumed, and how much is given back to the power grid at any given time. The second category for RESPONSIVE Living indicates the home’s ability to feed live updates of all the house systems and synchronize them to adapt and run most efficiently. The third category for GREEN Living is about “inviting the elements in” through lighting and venting, most notably with a rain catchment system designed to purify rainwater for potable use. 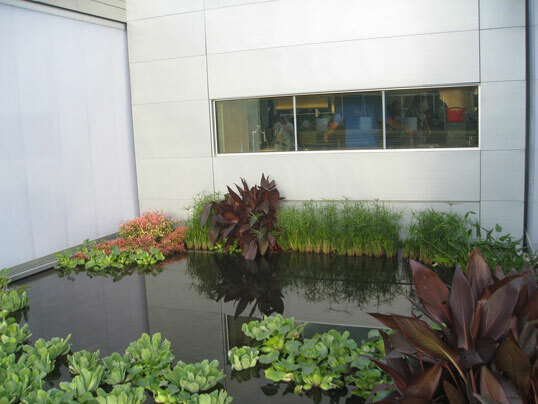 Grey water from the shower is also is directed through a series of biofilter ponds adjacent to the house, which recycle water for nonpotable use. As for green heating, a geo-thermal heat pump radiates heat through the concrete floor and is prompted by the home’s ‘smart systems’. The final two categories, for COMFORTABLE and PAVILION Living, combine high-tech and low-tech through intuitive design features that can be monitored and adjusted via Smartphone technology. The free-flowing floor plan, also a BauHaus feature, is designed to be flexible and focused around a central bathroom core, and the modular components of the house are easily scaled up, as multiple units can connect. But as a single unit, at just 800 square feet, the open plan and sliding walls provide spacious living with maximum flexibility. Glass is the most carbon intensive material which can be used in building. Producing glass suitable for large panels requires running equipment 24 hours per day, 362 days per year - think of it! All of these so-called modern houses which are based on early 19th century concepts of modern are absurdist jokes, especially this one which is also laced with steel and aluminum panels. The prototype, Edith Farnsworth\\\'s house in the midwest by Mies van der Rohe was the worst joke of all - a purist modernist conceit in a cow pasture. Edith ended up suing Mies for the cost of the house because it was so uncomfortable to live in, and so expensive to keep up that she moved out shortly after moving in. She then sued Mies, her architect as well as her former lover, for the cost of the house. Until this country has at least rudimentary scientific education, our architecture will continue to consist of such BeeS taught by our tenured architectural faculty, most of whom have little real world experience or even a fundamental grasp of valid scientific research. What i find fascinating about this house design, is that as long as you in a mostly sunny location, you can effectively plant the house anywhere, without the need to be near local services, electric, natural gas or water supplies. You could build this house in the middle of a field, or on an open hill where no-one else as ever thought of living. House of the future currently built. Maybe in some time every house will be self-sufficient: with water from its own brook and nutrient vegetables from its garden. What a beautiful and futuristic design! The shifting facade is not only utilitarian - it is state-of-the-art! I could see myself living in one tomrrow! The 2009 Solar Decathlon may have come to a close, but we wanted to shine a little more light on one of our favorite projects, Virginia Tech’s LUMENHAUS. Ranked 4th in this year's Architecture category, the LUMENHAUS is named for its “power of light” attributes and architectural references to the BauHaus movement, and was particularly inspired by Mies Van Der Rohe’s Farnsworth House. Like its historic reference, it is comprised of all glass walls, maximizing exposure to natural daylight. 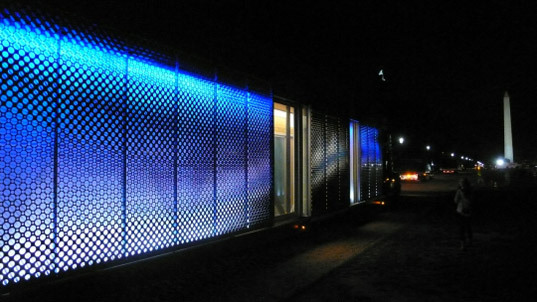 The house features an automated "Eclipse System" of highly insulated translucent panels that filters the light using independent sliding layers, creating an ever-changing pattern throughout the day.